Recently I have been trying to adapt my diet to the Autoimmune Protocol Diet / Paleo Approach diet. My hope is that like so many proponents of this approach, I will be able to reduce the impact of my disease. I have had a fairly easy time adapting to this approach so far (if you ignore the coffee I am still drinking) but breakfasts remain a challenge. This morning when I woke up, I was dreaming of making a cauliflower based breakfast porridge. It’s not often I have dreams that manifest into such yumminess in real life. This was sweet, creamy and crunchy. I also liked that it was quick and easy to whip up. Melt coconut oil over medium-high heat in a medium size sauce pan. Add the vegetables and cook until al dente. Make sure not to overcook the veggies, you want them to be crunchy. I chose to cook this on a slightly higher heat to maintain the crunchiness and to ensure they didn’t steam. Add spices and raisins and cranberries and cook for another 2-3 minutes. In the mean time, place coconut in a pan over medium-low heat until toasted nicely (between 2-4 minutes). 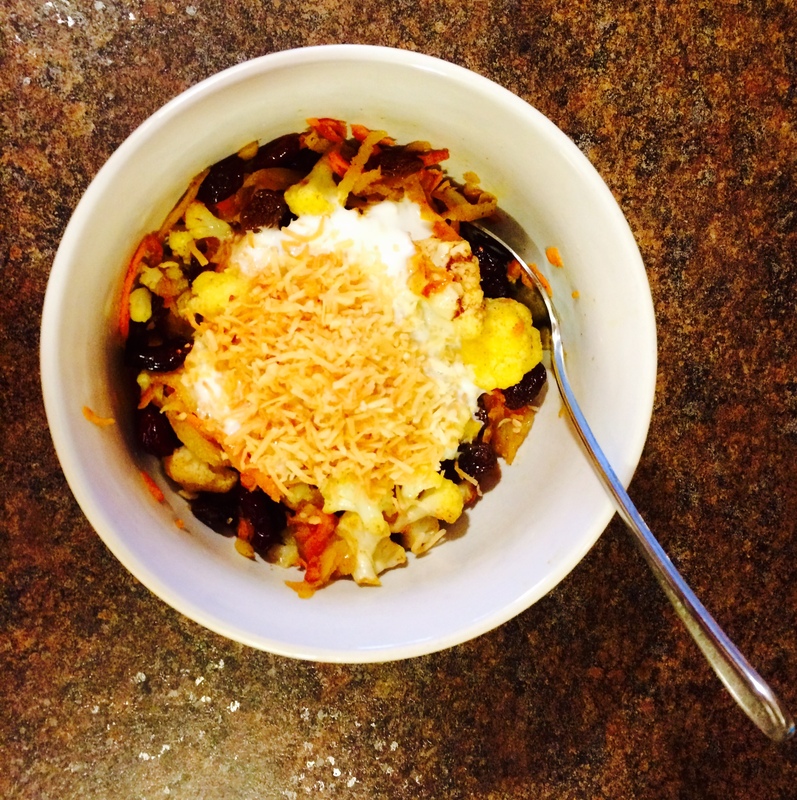 Pour vegetable mixture into a bowl, top with coconut yoghurt and toasted coconut. Enjoy! Prep time: 5 minutes, cook time 10 minutes. For those who are not raisin lovers, I think you could add a grated apple to this for the sweet factor. Anyone wanting extra sweetness could add a little honey. For me the flavour of the raisins added enough sweetness and adding honey would have been too much. Make sure the cauliflower is cut up very small. Larger pieces of cauliflower will taste too vegetabley and detract from the belief that you’re eating a grain based hot muesli. In the photo above some of my cauliflower pieces were too big. You know those chocolate chip cookies that have a bit if a crisp outside and an oooey gooey center? Well these gluten free chocolate chip cookies mimic those oh so well. I used to cheat on my wheat free diet every once in a whole when this friend of mine would bring his chocolate chip cookies to a potluck. Of course the cheating ended when I was diagnosed with gluten intolerance but luckily I now have this recipe to satisfy the craving. Though, I do not make these often as they disappear at an alarming rate and there is only two of us in this household. Whip butter until it is creamy. If the butter is not soft soften it in the microwave in intervals of 10 seconds but make sure not to melt it. Add sugars and beat again until smooth, add eggs and vanilla. Scrape down the sides of the bowl as needed. Slowly add the dry ingredients (except chocolate chips) making sure to mix the dough well to ensure you do not get any clumps of flour. Gently mix in the chocolate chips. 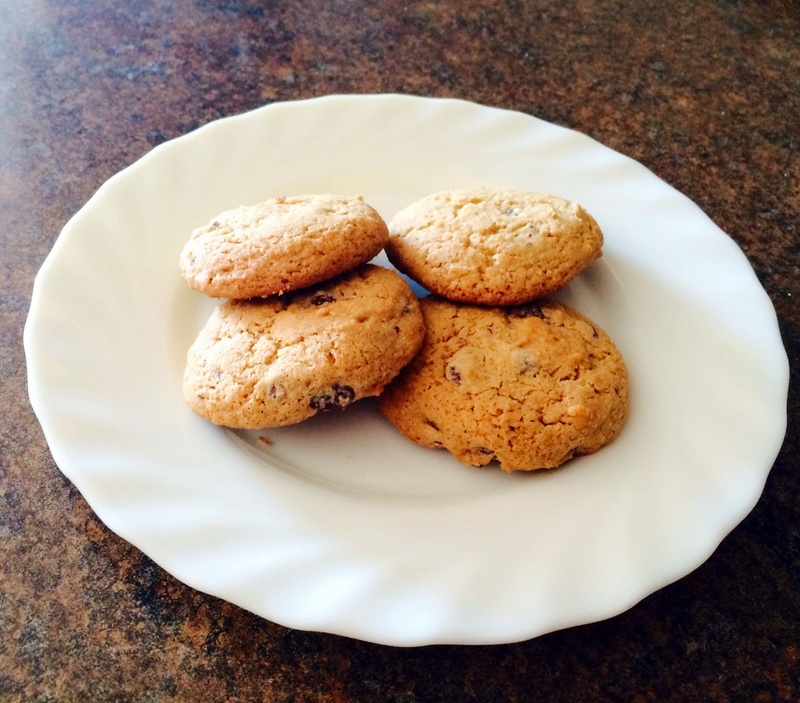 Use a 1″ disher scoop to drop the dough onto an ungreased cookie sheet. Make sure to leave space between the cookies as they will spread out a bit. If you do not have a disher scoop, you can drop by tablespoons. Disher scoops are handy for making uniform sized cookies. Bake for 9 to 12 minutes or until light golden brown. Let the cookies cool a little before you remove them from cookie sheets to cool on wire racks. Store in an airtight container for about 5 days or in the freezer for up to a month. I adapted this recipe from this recipe, which I found to be a little bit too chewy and sweet. This week has been a strange week for leftovers. For some reason, the other person that shares this house and all its food didn’t take many lunches. This left me with a rather large hunk of roast beef (meant to be used for roast beef sandwiches). Needless to say, there’s only so many roast beef sandwiches or roast beef reheats a girl can do. Today the limit was reached and when my special someone announced that there was another work lunch today, I realized that all that expensive grass fed, non-medicated blah blah blah roast beef was going to go to waste! Nooooooo! It seemed to me that this was an occasion to call on the resident superhero (also known as a the crock pot) to whip me up some lunch. I looked in the fridge and realized that I hadn’t roasted my veggies this week and that my portobello mushrooms were teetering on the edge of wasteland too. Then the idea formed, mushrooms, beef, noodles, in soup form is Beef Stroganoff but with less fat. Not that I’m against fat but sometimes it’s just, you know, a bit too much. This soup gives that Stroganoff taste but is a much lighter meal while being quite substantially heavier on the veggie portions side – gotta get your 7-10 a day! Beef – I used about 2-3 cups of cubed roast beef, but I’m sure you could use just about any lean cut (other than ground beef). GF beef bouillon – the amount will depend on your tastes and the type you have. Start low and work your way up, especially if your brand is high in sodium. Optional: GF onion bouillon, GF herb bouillon, GF veggie bouillon. I used quite a bit because I like a very robust flavored broth. Cube the beef, onions, mushrooms and place in a crock pot. Throw in the bouillon and spices. Cover with hot water to almost the top of the pot, leaving room for the pasta. Cook on high for 2.5 hours or until the onions and mushrooms are tender, stirring once or twice to make sure the spices etc. are mixing up nicely. Add pasta and continue to cook until the pasta is just al dante. The pasta will continue to cook as the soup cools so keep your eye on it so it does not overcook. You could probably use stew meat for this soup and it would be great. Some people prefer to brown the meat first. I have never had success with that method as my meat comes out tough every time. I find that it is much more tender if I just let the crock pot do the work. You can get a more caramelized flavor by browning the onions and mushrooms first. This is certainly not necessary but would give more depth of flavor. I use a tea ball for the bay leaves so that I don’t have to go fishing them out or serving them to people. 1 – 4 Tbs milk, heavy cream, soy milk, almond milk etc. The amount will depend on how thick you want your icing. Add the icing sugar and cocoa with your mixer on low. Be sure to scrape the bottom and sides of your bowl to make sure that all of the dry ingredients are blended well. Add your vanilla and then add your milk/milk substitute 1 tablespoon at a time until you reach the desired consistency of your frosting. If you add too much liquid you can add more icing sugar to thicken it up. Yield: Enough to decorate a 8″ layer cake or a batch of cupcakes/mini-cupcakes. I have not tried this yet but I believe this icing would taste pretty darn good if made with coconut oil rather than butter for those that cannot have dairy. For more variations on buttercream frosting see my post here. This weekend I was co-hosting a party that happened to fall on a friend’s birthday. I wanted to bake him a cake. His preference is cookies but to me, nothing says “Happy Birthday” like a cake. As I do nowadays, I asked Mr. Google for some gluten free recipes and found one that I thought would work well. Of course, I did not follow the original recipe exactly because that is just not what I do. So the recipe below is the altered version. 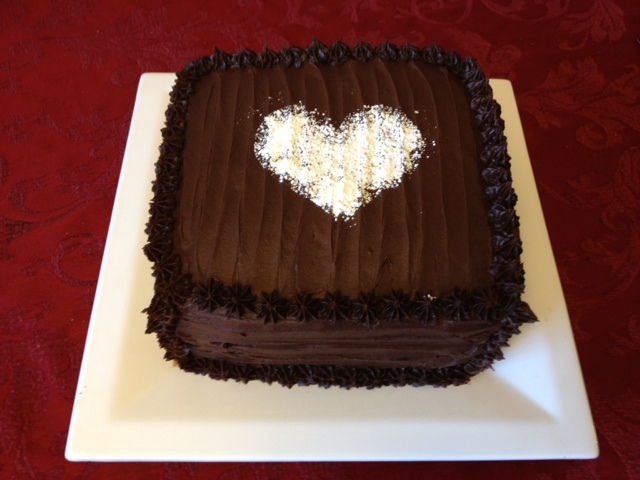 The cake got rave reviews and some people didn’t realize it was gluten free. Success! In fact, the reason that this is the first post and the reason for the post title is because a friend really wants the recipe. In my opinion, this cake was a bit dense. I would have liked it to be lighter and fluffier, like the cupcakes I made for my birthday last week but that’s a whole other topic. I think this cake turned out very pretty considering I’ve not decorated a cake in a very long time. Preheat the oven to 350°F. Prepare your pans. I used two 8×8 square pans, that I lined with parchment paper, then lightly greased using coconut oil. I find fitting the parchment to the pans difficult so I use a little oil on the pan so the parchment has something to stick to. Sift together or whisk together your dry ingredients and set aside. Beat the oil, eggs, water, and vanilla together until well mixed, preferably with a stand mixer but a hand mixer will do the trick. Gently mix in the dry ingredients adding them to the wet ingredients one cup at at time. Mix for 1 minute between each cup of dry ingredients. When all the ingredients are combined, scrape down your bowl then mix on medium-high for 2 minutes. Pour the batter into the prepared pans. This batter is quite thick so you will want to smooth it out before baking it. Bake the cakes for 30 to 35 minutes, until a toothpick inserted in the center of the cake comes out clean. Let the cakes cool a bit in the pan before you put them on cooling racks. Yield: two 8″ or 9″ round layers or 2 8×8 square cakes. 1-4 TBS milk, heavy cream, soy milk, almond etc. The amount will depend on how thick you want your icing. Note: I have not tried this yet but I believe this icing would taste pretty darn good if made with coconut oil rather than butter for those that cannot have dairy.